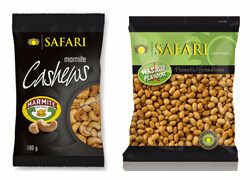 SAD Safari has gone the trendy route of ‘heat’ and umami in the snacking arena, with the introduction of a new range of choice-grade Marmite and Wasabi peanuts and cashews. Putting a new twist on an old favourite, Safari draws on the traditional savoury taste of Marmite, the much-loved vegetable extract spread, whilst also offering the spicy Asian flavour of wasabi. The packaging was designed by Barry Michaels from BMFA and Afripack in Paarl did the printing of the packs. The Marmite and Wasabi peanut range is available in 450g packs with a case configuration of 12 x 450g. The Safari Marmite and Wasabi cashew range is available in 100g packs with a case configuration of 12 x 100g. The full Marmite and Wasabi range has a shelf life of 6 months and will be available in leading supermarkets countrywide from November 2012 at a suggested retail price of approximately R29,99 for the peanuts and R26,99 for the cashews.